Located midway on a straight line between Chicago and St. Louis, Atlanta was a natural transportation and commercial center for central Illinois. By 1856, the site was something of a boom town with more than 40 commercial buildings, all built of wood. Therein lay a problem. During the following few years, several fires razed complete blocks of the commercial district, convincing local businesspeople, including Alexander Downey, who lost a building to one of the fires, to rebuild with brick. Completed in 1867,the Downey Building was one of the first and most impressive of Atlanta’s brick buildings. Of Italianate design with distinctive arched windows on both of its two stories, the building helped give Arch Street its flavor and its name. Although the Downey Building appears to be a single building, it was built as two commercial spaces behind a single façade. The southern half of the building was first occupied by the Exchange Bank of Atlanta, soon followed by the First National Bank of Atlanta who occupied the space for many years. After the turn of the century, the father and son law firm of J.L. and Frank Bevan moved into the space. After Frank Bevan's death in 1960, the local paper Atlanta Argus published there until a fire closed the building in 1973. In 1981, after sitting vacant for many years, the heirs of the Bevan family donated this half of the building to the Atlanta Public Library and Museum. Named the Palms because owner Robert Adams had once lived in California, the grill on Arch Street was a classic of its time--counters with stools, square tables with four chairs, a slot machine, a series of framed mirrors along one wall, Pepsi Cola chalk boards listing the day’s specials, and a dance floor in the back complete with piano. A tall neon sign on the building’s façade spelled out Palms CAFÉ in large letters. At the bottom of the sign was a light that, when burning, indicated that passengers were inside the grill ready to board the next Greyhound bus coming through town. Throughout the 1930s and 1940s, the Palms advertised its availability for “Club parties.” It soon became the town’s most prominent place for Atlantans and Route 66 travelers alike to gather and socialize. The Palms advertised dancing either every night or on certain nights of the week, and during the 1940s, locals played bingo there. According to local legend, the Palms attracted its share of celebrities. The most famous was boxer Max Baer, then heavyweight champion of the world. In 1934, he stopped at the Palms after a long all-night drive, ordered a piece of coconut pie, ate it with relish, tipped each employee a dollar, and told the cook, “My gosh, woman, that was the best pie I ever ate.” Then he and his entourage left for St. Louis where Baer had a theatrical engagement. 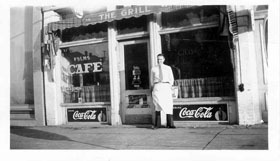 Throughout the 1940s and 1950s, the Palms continued to be a popular gathering spot, especially for the town’s high school students, many of whom held their first jobs there waiting table or pulling sodas. When the Palms closed in the 1960s, the space remained empty for several years. John Hawkins acquired this north side of the building by 1982 and remodeled the first floor for use as a living area and workshop. In 2002, the Hawkins family donated the north half of the building to the Atlanta Public Library and Museum. The Downey Building was listed in the National Register of Historic Places in 2004. Bill Thomas, who was deeply involved in the project to open the museum and library, calls the listing a crucial first step because of the funding opportunities it enabled. When the library acquired the building, it was in rough shape -- the north side had been completely gutted; the roof was a shambles, and a nine-inch gap separated the façade from the side walls. One of the earliest grants for what ended up being an approximately $500,000 project came from the National Park Service’s Route 66 Corridor Preservation Project; the Program ultimately contributed approximately $55,000 to the building rehabilitation. Other funders included the Illinois Bureau of Tourism, approximately $100,000; the Illinois Landmarks Preservation Council, approximately $10,000; the Atlanta High School Alumni Association, approximately $147,000; the Atlanta Library; and local residents. The money bought the interior rehabilitation; new roof; and brick-by-brick removal, cleaning, and reconstruction of the façade that makes the Downey Building such a significant local showpiece today. 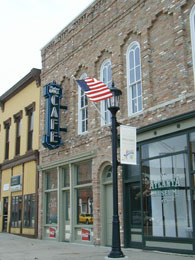 Today the Downey Building, located in an historic area, has been restored and houses the Palms Grill and Atlanta Museum. After having lunch at the grill, you can stroll along Arch Street and view the Hawes Grain Elevator and the octagon-shaped Atlanta Public Library, both listed in the National Register of Historic Places. Don’t miss Atlanta’s Route 66 Park with its 19-foot statue of a man holding a hotdog. Downtown is also the site of the Atlanta Betterment Fest, not to be missed each summer. The Downey Building is at 110 and 112 Southwest Arch St. in Atlanta, IL. The Palms Grill is at 110 Southwest Arch St., and is open Sunday-Thursday 8:00am to 5:00pm and Friday and Saturday 8:00am to 8:00pm, and is wheelchair accessible. Call 217-648-2233 for information or visit the Palms Grill Cafe website. The Atlanta Museum is at 112 Southwest Arch St., and is open Monday-Saturday 9:00am to 4:30pm. The first floor is wheelchair accessible and the museum is free. Call the Atlanta Public Library at 217-648-2112 or the Palms Grill for information. The National Register nomination form for the building can be found here.